Dave Barter put together the wonderful book, Great British Bike Rides, which brings together 40 of the best road rides in England, Scotland and Wales . He leaves his favourite ride, Lochinver and Assynt, to the last in the book. 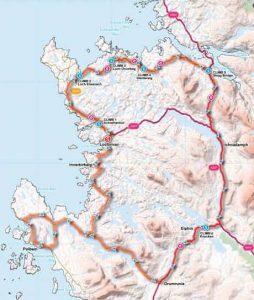 I have ridden this loop many times, in both directions, leaving Lochside House with anticipation and always returning with tired legs but a huge smile on my face, I agree with Dave its an amazing ride. Rapha Continental was set up in the US in 2007 to discover those great bike routes around the world less traveled by. In May 2012 they chose Assynt as it first destination in the UK. The weather ensured they had an epic time. Read all about it here and watch the video below. Love Lochinver is a place to gather together people who care from afar, to grow the support and passion that we have for Lochinver and for the area, beyond the few weeks we get to spend here each year.